When World War I broke out, the socialists met on 4th August 1914 to engage the struggle for internationalism and against the war: there were seven of them in Rosa Luxemburg's apartment. This reminiscence, which reminds us that the ability to swim against the current is one of the most important of revolutionary qualities, should not lead us to conclude that the role of the proletarian party was peripheral to the events which shook the world at that time. The contrary was the case, as we have tried to show in the first two articles of this series to commemorate the 90th anniversary of the revolutionary struggles in Germany. In the first article, we put forward the thesis that the crisis in the Social-Democracy, in particular in the German SPD - the leading party of the Second International - was one of the most important factors making it possible for imperialism to march the proletariat to war. In Part 2 we argued that the intervention of revolutionaries was crucial in enabling the working class, in the midst of war, to recover its internationalist principles, thus making possible the ending of the imperialist carnage by revolutionary means (the November Revolution of 1918). In so doing, they set down the foundations for a new party and a new International. And in both of these phases, we pointed out, the capacity of revolutionaries to understand the priority of the moment was the precondition to their playing such an active and positive role. After the breaking up of the international in face of war, the task of the hour was to understand the causes of this fiasco, and to draw the lessons. In the struggle against war, the responsibility of true socialists was to be the first to raise the banner of internationalism, to light up the path towards revolution. The workers' uprising of 9th November 1918 brought the war to an end on the morning of November 10th 1918. The German Emperor and countless German princelings were overthrown - a new phase of the revolution was beginning. 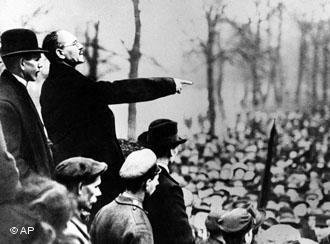 Although the November uprising was led by the workers, Rosa Luxemburg called it the "revolution of the soldiers". This was because the spirit which dominated it was that of a profound longing for peace. A desire which the soldiers, after four years in the trenches, embodied more than any other social group. This was what gave that unforgettable day its specific colour and its glory, and which fed its illusions. Since even parts of the bourgeoisie were relieved that the war was finally over, general fraternisation was the mood of the day. Even the two main protagonists of the social struggle, the bourgeoisie and the proletariat, were affected by the illusions of 9th November. The illusion of the bourgeoisie was that it could still use the soldiers coming from the front against the workers. In the days which followed, this illusion dissipated. The "grey coats" wanted to go home, not to fight the workers. The illusion of the proletariat was that the soldiers were already on their side and wanted revolution. During the first sessions of the Workers' and Soldiers' Councils which were elected in Berlin on November 10th, the soldiers' delegates nearly lynched those revolutionaries who spoke of the necessity to continue the class struggle, and who identified the new Social Democratic government as the enemy of the people. These workers' and soldiers' councils were, in general, marked by the weight of human inertia which curiously marks the beginning of every great social upheaval. Very often, soldiers elected officers as their delegates, and workers appointed the same Social-Democratic candidates they had voted for before the war. Thus, these councils found nothing better to do than appoint a government led by the warmongers of the SPD, and to decide their own suicide in advance by calling general elections to a parliamentary system. Despite the hopelessness of these first measures, the workers' councils were the heart of the November Revolution. As Rosa Luxemburg pointed out, it was above all the appearance of these organs which proved and embodied the essentially proletarian character of this upheaval. But now a new phase of the revolution was opened up, in which the central question was no longer that of the councils but of the class party. The phase of illusions was coming to an end, the moment of truth, the outbreak of civil war was approaching. The workers' councils, through their very function and structure as organs of the masses, are capable of renewing and revolutionising themselves from one day to the next. The central question now was: would the determined revolutionary, proletarian outlook gain the upper hand within the councils, within the working class? In order to be victorious, the proletarian revolution needs a unified, centralised political vanguard in which the class as a whole has confidence. This was perhaps the most important lesson of the October Revolution in Russia the previous year. The task of this party, as Rosa Luxemburg had argued in 1906 in her pamphlet about the Mass Strike, is no longer to organise the masses, but to give the class a political leadership, and a real confidence in its own capacities. But at the end of 1918 in Germany there was no such party in sight. Those socialists who opposed the pro-war policies of the SPD were mainly to be found in the USPD, the former party opposition subsequently excluded by the SPD. A mixed bunch with tens of thousands of members, from pacifists and those who wanted a reconciliation with the warmongers, to principled revolutionary internationalists. The main organisation of these internationalists, the Spartakusbund, was an independent fraction within the USPD. Other, smaller internationalist groups, such as the IKD (which emerged from the left opposition in Bremen) were organised outside the USPD. The Spartakusbund was well known and respected among the workers. But the recognised leaders of the strike movements against the war were not these political groups, but the informal structure of factory delegates, the "revolutionäre Obleute". By December 1918 the situation was becoming dramatic. The first skirmishes leading to open civil war had already taken place. But the different components of a potential revolutionary class party - the Spartakusbund, the other left elements in the USPD, the IKD, the Obleute were still separate entities, and still mainly hesitant. Under the pressure of events, the question of the foundation of the party began to be posed more concretely. In the end, it was dealt with in a great hurry. The first national congress of the Workers' and Soldiers' Councils had come together in Berlin on 16th December. While 250,000 radical workers demonstrated outside to put pressure on the 489 delegates (of whom only 10 represented Spartakus, 10 the IKD), Rosa Luxemburg and Karl Liebknecht were not allowed to address the meeting (under the pretext that they had no mandate). When this congress concluded by handing over its power to a future parliamentary system, it became clear that revolutionaries would have to reply to this in a unified manner. On 14th December 1918, the Spartakusbund published a programmatic declaration of principles: What does the Spartakusbund want? On 17th December, a national conference of the IKD in Berlin called for the dictatorship of the proletariat, and for the formation of a class party through a process of regroupment. The conference failed to reach agreement on whether or not to participate in the coming elections to a national parliamentary assembly. Around the same time, leaders within the left of the UPSD, such as Georg Ledebour, and among the factory delegates, such as Richard Müller, began to raise the question of the need of a united workers' party. At the same moment, delegates of the international youth movement were meeting in Berlin, where they set up a secretariat. On 18th December, an international youth conference was held, followed by a mass meeting in Berlin Neukölln, where Karl Liebknecht and Willi Münzenberg spoke. It was in this context that a meeting in Berlin of Spartakusbund delegates decided on 29th December to break with the USPD and form a separate party. Three delegates voted against this decision. The same meeting called for a joint conference of Spartakus and the IKD, to begin in Berlin the following day, at which 127 delegates from 56 cities and sections participated. This conference was partly made possible through the mediation of Karl Radek, delegate of the Bolsheviks. Many of these delegates did not realise until their arrival that they had been summoned to form a new party. The factory delegates were not invited to participate, since it was felt that it would not yet be possible to unite them with the very decided revolutionary positions defended by a majority of the often very young members and supporters of Spartakus and the IKD. Instead, it was hoped that the factory delegates would join the party once it had been formed. What became the founding congress of the KPD brought together leading figures of the Bremen Left (including Karl Radek, althought he represented the Bolsheviks at this meeting), who felt that the foundation of the party was long overdue, and of the Spartakusbund, such as Rosa Luxemburg and above all Leo Jogiches, whose principle worry was that this step might be premature. Paradoxically, both sides had good arguments to justify their stances. The Russian Communist Party (Bolshevik) sent six delegates to the conference, two of whom were prevented from participating by the German police. Two of the main discussions at what became the founding congress of the KPD concerned the question of parliamentary elections and the trade unions. These were issues which had already played an important role in the debates before 1914, but which had become secondary in the course of the war. Now they returned to centre stage. Karl Liebknecht already took up the parliamentary issue in his opening presentation on the "Crisis in the USPD". The first national Congress of the Workers' Councils in Berlin had already posed the question which would inevitably split the USPD: National Assembly or Council Republic? It was the responsibility of all revolutionaries to denounce the bourgeois elections and its parliamentary system as counter-revolutionary, as the death of the rule of the workers' councils. But the leadership of the USPD had refused the calls both of the Spartakusbund and of the Obleute in Berlin for an extraordinary congress to debate and decide this question. Speaking for the Bolshevik delegation, Karl Radek further developed this understanding that it was historical development itself which determined not only the need for a founding congress, but even its agenda. With the end of the war, the logic of the revolution in Germany would necessarily be different to that in Russia. The central question was no longer peace, but food supplies and their price, and the question of unemployment. In putting the question of the National Assembly and "economic struggles" on the agenda the during first two days of the congress, the leadership of the Spartakusbund hoped for a clear position for the workers' councils against the bourgeois parliamentary system and against the outdated trade union form of struggle, as a solid programmatic basis for the new party. But the debates went further than this. The majority of delegates came out against any participation in bourgeois elections, even as a means of agitation against them, and against working within the trade unions. At this level, the congress was one of the strong moments in the history of the workers' movement. It helped to formulate, for the first time ever in the name of a revolutionary class party, these radical positions corresponding to the new epoch of decadent capitalism. These ideas were to strongly influence the formulation of the Manifesto of the Communist International, written some months later by Trotsky. And they were to become basic positions of the Communist Left - as they are to this day. The interventions of the delegates who defended these positions were often marked by impatience and a certain lack of argumentation, and were criticised by the experienced militants including Rosa Luxemburg, who did not share their most radical conclusions. But the minutes of the meeting illustrate well that these new positions were not the product of individuals and their weaknesses, but of a profound social movement involving hundreds of thousands of class conscious workers. Gelwitzki, delegate from Berlin, called on the party, instead of participating in the elections, to go the barracks to convince the soldiers that the assembly of the councils is the "government of the world proletariat", the national assembly that of the counter revolution. Levine, delegate from Neukölln (Berlin), pointed out that the participation of Communists in the elections could not but reinforce the illusions of the masses. In the debate on the economic struggles, Paul Frölich, delegate from Hamburg, argued that the old trade union form of struggle was now out of date, since it was based on a separation between the economic and the political dimensions of the class struggle. Hammer, delegate from Essen, reported how the miners in the Ruhr area were throwing away their trade union membership books. As for Rosa Luxemburg herself, who still favoured working within the trade unions for tactical purposes, she declared that the struggle of the proletariat for its liberation is identical with the struggle for the liquidation of the trade unions. The programmatic debates at the founding congress were of great historic importance, above all for the future. But at the moment of the foundation congress itself, Rosa Luxemburg was profoundly right in saying that both the question of parliamentary elections and the trade unions were secondary. On the one hand, the question of the role of these institutions in what had become the epoch of imperialism, of war and revolution, was still too new in the workers' movement Both the debate and practical experience were still insufficient to fully clarify the issue. For the moment it was enough to know and agree that the mass unitary organs of the class, the workers' councils, and not parliament or the trade unions, are the means of the workers' struggle and of the proletarian dictatorship. On the other hand, these debates tended to divert from the main task of the congress, which was to identify the next steps of the class on the road to power. This question, tragically, the congress failed to clarify. The key discussion on this issue was opened by a Rosa Luxemburg's presentation on "Our Programme" on the afternoon of the second day (31st December 1918). Here she explored the nature of what had been called the second phase of the revolution. The first phase, she said, had been immediately political, since directed against the war. During the November Revolution, the question of the specific economic class demands of the workers had been sidelined. This in turn helped to explain the relatively low level of class consciousness which accompanied these events, expressed in a general wish for reconciliation and for a "reunification" of the "socialist camp". For Rosa Luxemburg, the main characteristic of the second phase of the revolution would be the return of the class' economic demands to centre stage. Here, she was not forgetting that the conquest of power is above all a political act. Instead she was highlighting another important difference between the revolutionary process in Russia and in Germany. In 1917 the Russian proletariat came to power without much deployment of the strike weapon. But, Rosa Luxemburg pointed out, this was possible because the revolution in Russia began, not in 1917, but in 1905. In other words, the Russian proletariat had already gone through the experience of the mass strike before 1917. At the congress, she did not repeat the main ideas developed by the left of Social Democracy about the mass strike after 1905. She could safely assume that these were still present in the minds of the delegates. Here we will briefly recall: the mass strike is the precondition for the seizure of power, precisely because it explodes the separation between the economic and political struggles. And whereas the trade unions, even at their strongest moment as instruments of the workers, only organise minorities of the class, the mass strike activates the "knotted up mass of the helots" of the proletariat, the unorganised masses untouched by the light of political education. The workers' struggle is directed not only against material poverty. It is an insurrection against the existing division of labour itself, led by its main victims, the wage slaves themselves. The secret of the mass strike is the striving of the proletarians to become full human beings. Last but not least: the mass strike would be led by rejuvenated workers' councils, giving the class the organisational means to centralise its struggle for power. This is why Rosa Luxemburg, in her congress speech, insisted that the armed insurrection is the last, not the first act of the struggle for power. The task of the hour, she said, is not to topple the government, but to undermine it. The main difference to the bourgeois revolution, she argued, is its mass character, coming from "below". But precisely this was not understood at the congress. For many of the delegates, the next phase of the revolution was characterised, not by mass strike movements, but by the immediate struggle for power. This confusion was expressed particularly clearly by Otto Rühle, who claimed that it would be possible to seize power within 14 days. Even Karl Liebknecht, while admitting the possibility of a long drawn-out revolution, did not want to exclude the possibility of an "extremely rapid victory" in the "coming weeks." We have every reason to believe the eye witness accounts, according to which Rosa Luxemburg in particular was shocked and alarmed by the results of this congress. As for Leo Jogiches, his first reaction is said to have been to advise Luxemburg and Liebknecht to leave Berlin and go into hiding for a while. He feared that the party and the proletariat were heading towards a catastrophe. What alarmed Rosa Luxemburg most were not the programmatic positions adopted, but the blindness of most of the delegates to the danger represented by the counter-revolution, and the general immaturity with which the debates were conducted. Many interventions were characterised by wishful thinking, giving the impression that a majority of the class already stood behind the new party. The presentation of Rosa Luxemburg was greeted with jubilation. A motion of 16 delegates was immediately passed, to publish it as quickly as possible as an "agitation pamphlet". As opposed to this, the congress itself failed to discuss it seriously. In particular, hardly any intervention took up its main idea: that the struggle for power was not yet on the agenda. One laudable exception was the contribution of Ernst Meyer, who spoke about his recent visit to the provinces east of the river Elbe. He reported that large sectors of the petty bourgeoisie were speaking of the necessity to teach Berlin a lesson. He continued: "I was even more shocked by the fact that even the workers in the cities have not yet understood the necessities of the situation. This is why we have to develop with all our might our agitation not only in the countryside, but also in the small and middle size towns." Meyer also replied to Paul Frölich's idea of encouraging the creation of local council republics. "It is absolutely typical of the counter-revolution that it propagates the possibility of independent republics, expressing nothing but the desire to split up Germany into zones of social differentiation, removing the socially backward regions from the influence of the socially progressive ones." Particularly significant was the intervention of Fränkel, delegate from Königsberg, who proposed that there should be no discussion about the presentation at all. "I am of the opinion that a discussion about the magnificent speech of comrade Luxemburg would only weaken it" he declared. This contribution was followed up by an intervention of Bäumer, who declared that the proletarian position against any participation in elections was so evident, that he "bitterly regretted" that there had been any discussion on the subject at all. Rosa Luxemburg was supposed to make the conclusion to this discussion. In the end, no conclusion was made. The chairman announced: "Comrade Luxemburg is unfortunately not able to make a conclusion, she is not feeling well." What Karl Radek was later to describe as the "youthful immaturity" of the founding congress was thus characterised by impatience and naivety, but also by a lack of culture of debate. Rosa Luxemburg had spoken about this problem the previous day. "I have the impression that you are taking your radicalism too lightly. Specifically the call for ‘rapid voting' proves this. That is not the maturity and the earnest spirit which belongs in this hall (...) We are called upon to accomplish the greatest tasks in world history, and we cannot be mature and thorough enough in thinking about which steps we have ahead of us in order to safely reach our goal. Decisions of such importance cannot be taken lightly. What I miss here is an attitude of reflection, the seriousness which by no means excludes revolutionary élan, but needs to be coupled with it." The negotiations with the "factory delegates"
The revolutionäre Obleute of Berlin sent a delegation to the congress to negotiate their possible adherence to the new party. A peculiarity of these negotiations was that the majority of the seven delegates considered themselves as the representatives of the factories where they worked, casting their votes on specific issues on the basis of some kind of proportional system, only after consultation with "their" workforce, who seem to have assembled for the occasion. Liebknecht, who led the negotiations for Spartakus, reported back to the congress that, for instance on the question of participation in the elections to the National Assembly, 26 votes had been cast in favour, and 16 votes against. Liebknecht adds: "But among the minority there are the representatives of the extremely important factories in Spandau, who have 60,000 workers behind them." Däumig and Ledebour, who were representatives of the left of the USPD, not Obleute, did not participate in the voting. Another bone of contention was the demand of the Obleute for parity in the programme and the organisational commissions nominated by the congress. This was turned down on the grounds that the delegates represented a large part of the working class of Berlin, whereas the KPD represented the class in the whole country. But the main dispute, which seems to have poisoned the atmosphere of negotiations which had begun very constructively, concerned the strategy and tactics for the coming period i.e. the very question which should have been at the heart of the congress deliberations. Richard Müller demanded that the Spartakusbund abandon what he called its "putschist tactic." He seemed in particular to be referring to the tactic of daily armed demonstrations through Berlin, led by the Spartakusbund, at a moment when, according to Müller, the bourgeoisie was trying to provoke a premature confrontation with the political vanguard in Berlin. To which Liebknecht replied: "You sound like a mouthpiece of Vorwärts" (the counter-revolutionary paper of the SPD). As Liebknecht describes it to the congress, this seems to have been the negative turning point of the negotiations. The Obleute, who until then were satisfied to have five representatives in the above mentioned commissions, now reverted to demanding eight etc. The factory delegates even began threatening to form a party of their own. The congress went on to pass a resolution blaming "pseudo radical elements from the bankrupt USPD" for the failure of the negotiations. Under different "pretexts" these elements were trying to "capitalise on their influence over the revolutionary workers." The article about the congress, which appeared in the January 3rd 1919 issue of Die Rote Fahne, which was written by Rosa Luxemburg, expressed a different spirit. This article speaks of the beginning of negotiations towards unification with the Obleute and the delegates of the big Berlin factories, the beginning of a process which "as a matter of course, irresistibly, will lead to a process of unification of all true proletarian and revolutionary elements in a single organisational framework. That the revolutionary Obleute of Greater Berlin, the moral representatives of the vanguard of the Berlin proletariat, will join up with the Spartakusbund, is proven by the cooperation of both sides in all the revolutionary actions of the working class in Berlin to date." How to explain these flawed birth marks of the KPD? After the defeat of the revolution in Germany, a series of explanations were put forward, both within the KPD and the Communist International, which emphasised specific weaknesses of the movement in Germany, in particular in comparison with Russia. The Spartakusbund was accused of having defended a "spontaneous" and so-called Luxemburgist theory of the formation of the party. One sought here the origins of everything from the alleged hesitation of the Spartakists to separate from the war mongers in the SPD, to the so-called leniency of Rosa Luxemburg towards the young "radicals" in the party. The origins of the alleged "spontaneist theory" of the party is habitually traced back to Rosa Luxemburg's pamphlet about the 1905 revolution in Russia - The Mass Strike, the Political Party and the Trade Unions - where she allegedly calls for the intervention of the masses in the struggle against the opportunism and reformism of Social Democracy as an alternative to the political and organisational struggle within the party itself. In reality, the recognition that the progress of the class party depends on a series of "objective" and "subjective" factors, of which the evolution of the class struggle is one of the most important, was a basic thesis of the Marxist movement long before Rosa Luxemburg. Above all, Rosa Luxemburg did propose a very concrete struggle within the party: The struggle to re-establish the political control of the party over the social democratic trade unions. It is a common belief, in particular among syndicalists, that the organisational form of the political party is much more prone to capitulate to the logic of capitalism than the trade unions who directly organise the workers in struggle. Rosa Luxemburg understood very well that the opposite is the case, since the trade unions mirror the reigning division of labour which is the most profound basis of class society. She understood that the trade unions and not the SPD were the main carriers of opportunist and reformist ideology in pre-war Social Democracy, and that under cover of the slogan of their "autonomy" the trade unions were in reality taking over the workers' political party. It is true that this strategy proposed by Luxemburg proved insufficient. But this does not make it "spontaneist" or syndicalist (!) as is sometimes alleged! Similarly, the orientation of Spartakus during the war to form an opposition first within the SPD and then the USPD, expressed not an underestimation of the party, but an unswerving determination to fight for the party, to prevent its best elements falling into the hands of the bourgeoisie. In an intervention at the fourth congress of the KPD, in April 1920, Clara Zetkin claimed that Rosa Luxemburg, in her last letter to Zetkin, had written that the foundation congress had been mistaken in not making the acceptance of participation in the elections a condition for membership in the new party. There is no need to doubt the sincerity of Clara Zetkin in making this claim. The capacity to read what other people really write, and not what you would want or expect them to, is probably rarer than is generally assumed. The letter of Luxemburg to Zetkin, dated January 11, 1919, was later published. What Rosa Luxemburg wrote is as follows: "But above all, as far as the question of the non participation in the elections is concerned: You enormously overestimate the importance of this decision. There were no ‘Rühlists" present, Rühle was not a leader at the Conference. Our ‘defeat' was only the triumph of a somewhat childish, immature, unswerving radicalism (...) We all decided unanimously not to make of this casus a cabinet question, not to take it tragically. In reality, the question of the National Assembly will be pushed right into the background by the stormy developments, and when things proceed as they are doing, it appears questionable enough if the elections to the National Assembly will even take place". The fact that the radical positions were often put forward by those delegates who most clearly expressed the impatience and immaturity of that Conference, helped to give the impression that this immaturity was the product of the refusal to participate in bourgeois elections or in the trade unions. This impression was to have tragic consequences about a year later when the leadership, at the Heidelberg Conference, excluded the majority on account of their position on the elections and the trade unions. This was not the attitude of Rosa Luxemburg, who knew that there is no alternative to the necessity for revolutionaries to pass on their experience to the next generation, and that a class party cannot be founded without the participation of the young generation. The alleged "déclassé" character of the "young radicals"
After the exclusion of the radicals from the KPD, and of the KAPD from the Communist International, there was the beginning of a theorisation of the role of the "radicals" within the young party as an expression of the weight of "uprooted" and "déclassé" elements. It is certainly true that, among the young supporters of the Spartakusbund during the war, more particularly within the ranks of the groupings of "red soldiers", the war deserters, the invalids etc. there were currents who dreamt of destruction and "total revolutionary terror". Some of these elements were highly dubious, and the Obleute were rightly suspicious of them. Others were hotheads, or simply young workers politicised by the war, who had learnt of no way of articulating their ideas other than fighting with a gun, and who longed for the kind of "guerrilla" campaigns as were soon to be practised by Max Hoelz. This interpretation was taken up again in the 1970s by authors such as Fähnders and Rector in their book Linksradikalismus und Literatur. They attempted to illustrate their thesis of the link between Left Communism and "lumpenisation" through the example of the biographies of radical artists and writers of the left, rebels who, like the young Maxim Gorki or Jack London, had rejected existing society by placing themselves outside of it. Referring to one of the most influencial leaders of the KAPD, they wrote: "Adam Scharrer was one of the most radical representatives of international rebelliousness (...) leading him to the extreme rigid positions of the Communist Left." In reality, most of the young militants of the KPD and the Communist Left were politicised in the socialist youth movement before 1914. Politically they were not a product of the "uprooting" and "lumpenisation" caused by the war. But their politicisation did gravitate around the question of war. As opposed to the older generation of socialist workers, who suffered the weight of decades of political routine in the epoch of the relative stability of capitalism, the socialist youth was directly mobilised by the spectre of approaching war, developing a strong "anti-militarist" tradition. And whereas the Marxist Left became an isolated minority within Social Democracy, their influence within the radical youth organisations was much stronger. As for the accusations that the "radicals" had been tramps in their youth, this fails to take into account that these years of "wandering" were a typical part of proletarian biographies at that time. Partly a leftover of the old tradition of the wandering journeyman which still characterised the first socialist political organisations in Germany like the Communist League, this tradition was above all a fruit of the workers' struggle to ban child factory work. Many young workers would set out to "see the world" before having to submit to the yoke of wage slavery. Going on foot, they would explore the German speaking countries, Italy, the Balkans and even the Middle East. Those connected to the workers' movement would find free or cheap accommodation in the trade union houses in the big cities, political and social contacts and support in the local youth organisations. In this way hubs of international exchange appeared around political, cultural, artistic and scientific developments. Others went to sea, learning languages and establishing socialist links across the globe. No wonder this youth became a vanguard of proletarian internationalism throughout Europe! Who were the "revolutionäre Obleute"? The counter-revolution accused the Obleute of being paid agents of foreign governments, of the Entente and then of "World Bolshevism". In general they have gone down in history as a kind of grass roots trade unionist, localist and factory oriented, anti-party current. Within "operaist" circles they have been considered with admiration as a kind of revolutionary conspiracy out to sabotage the imperialist war. How else to explain the way they "infiltrated" the key sectors and plants of the German arms industry? Let's stick to the facts. The Obleute began as a small circle of Social-Democratic party functionaries and militants, who had gained the confidence of their colleagues through their unswerving opposition to the war. They were particularly strongly based in the capital, Berlin, and in the metal industry, above all among the turners. They belonged to the most intelligent, educated workers with the highest wages. But they were renowned for their sense of support and solidarity towards other, weaker sectors of the class, such as the women mobilised to replace male workers sent to the front. In the course of the war a whole network of politicised workers grew up around them. Far from being an anti-party current, they were almost exclusively composed of former Social-Democrats, who were now members or sympathisers of the left wing of the USPD, including the Spartakusbund. They participated passionately in all the political debates which took place in the revolutionary underground throughout the war. The particular form this politicisation took was to a large degree determined by the conditions of clandestine activity, making mass assemblies rare and open discussion impossible. In the factories, the workers protected their leaders from repression, often with remarkable success. The extensive spy system of the trade unions and the SPD regularly failed to even find out the names of the "ringleaders". In case of arrest, each of these delegates had named a substitute who immediately filled the gap. The "secret" of their capacity to "infiltrate" the key sectors of industry was very simple. They belonged to the "best" workers, so that the capitalists competed with each other to sign them up. In this way, the employers themselves, without knowing it, put these revolutionary internationalists in key positions of the war economy. It is no peculiarity of the situation in Germany that the three above mentioned forces within the working class played crucial roles in the drama of the formation of the class party. One of the characteristics of Bolshevism during the revolution in Russia was the way it united basically the same forces within the working class: the pre-war party representing the programme and the organisational experience; the advanced, class conscious workers in the factories and work places, who anchored the party in the class, played a decisive, positive role in resolving the different crises in the organisation; and revolutionary youth politicised by the struggle against war. Compared with this, what is striking in Germany is the absence of a similar degree of unity and mutual confidence between these essential components. This, and not any inferior quality of these elements themselves, was crucial. Thus, the Bolsheviks possessed the means to clarify their confusions while maintaining and enforcing their unity. In Germany this was not the case. The revolutionary vanguard in Germany suffered from a more deeply rooted lack of unity and of confidence in its own mission. One of the main explanations for this is that the German revolution faced a much more powerful enemy. The bourgeoisie in Germany was certainly more ruthless than in Russia. Moreover, the phase of history inaugurated by the world war had delivered a new and mighty weapon into its hands. Germany before 1914 was the country with the most developed organisations of the workers' movement worldwide. In a new era, when the trade unions and the mass social democratic parties could no longer serve the cause of the proletariat, these instruments because enormous obstacles. Here the dialectics of history were at work. What had once been a strength of the German working class now became its weakness. It takes courage to attack such a formidable fortress. The temptation can be very strong to ignore the strength of the enemy in order to reassure yourself. But the problem was not only the strength of the German bourgeoisie. When the Russian proletariat stormed the bourgeois state in 1917, world capitalism was still divided by the imperialist war. It is a well known fact that the German military actually helped Lenin and other Bolshevik leaders to return to Russia, since they hoped that this would in some way weaken the military resistance of their opponent on the Eastern front. Once the war was over the world bourgeoisie united against the proletariat. One of the strong moments of the first congress of the KPD was the adoption of a resolution identifying and denouncing the military collaboration of the British and German military with the local landlords in the Baltic states in the training of counter-revolutionary paramilitary units directed against "the Russian Revolution today" and the "German revolution tomorrow". In such a situation, only a new International could have given revolutionaries and the whole proletariat in Germany the necessary confidence and self-confidence. The revolution could still be victorious in Russia without the presence of a world class party, because the Russian bourgeoisie was relatively weak and isolated - but this was not true in Germany. The Communist International was not yet founded when the decisive confrontation of the German revolution took place in Berlin. Only such an organisation, by bringing together the theoretical acquisitions and the experience of the whole proletariat, could have been equal to the task of leading a world revolution. It was only the outbreak of the Great War itself which made revolutionaries realise the need for a truly united and centralised international left opposition. But under the conditions of war it was extremely difficult either to link up organisationally or to clarify the political divergences which still separated the two most important currents of the pre-war left: the Bolsheviks around Lenin, and the German and Polish Lefts around Rosa Luxemburg. This absence of unity before the war made it all the more difficult to make the political strengths of currents in different countries the common heritage of all, and to attenuate the weaknesses of each. In no country was the shock of the collapse of the Socialist International as profound as in Germany. There, the confidence in such qualities as theoretical formation, political leadership, centralisation or party discipline was profoundly shaken. The conditions of war, the crisis of the workers' movement, made it difficult to restore such confidence. In this article we have concentrated on the weaknesses which appeared in the formation of the party. This was necessary in order to understand the defeat at the beginning of 1919, the subject of the next article. But despite these weaknesses, those who came together at the moment of the foundation of the KPD were the best representatives of their class, embodying all that is noble and great-hearted in humanity, the true representatives of a better future. We will return to this question at the end of this series. The unification of revolutionary forces, the formation of a political leadership of the proletariat worthy of the name, had become the central question of the revolution. Nobody understood this better than the class directly threatened by this process. From the November 9 Revolution on, the main thrust of the political life of the bourgeoisie was directed towards the liquidation of the Spartakusbund. The KPD was founded in the midst of this pogrom atmosphere, preparing the decisive blows against the revolution which were soon to follow. Sozialdemokratische Partei Deutschlands (German Social-Democratic Party). German soldiers in "feldgrau" uniform. Internationale Kommunisten Deutschlands (International Communists of Germany). Jogiches on the other hand seems to have wanted the Obleute to take part in founding the party. Six of the militants present at this conference were murdered by the German authorities in the following months. Der Gründungsparteitag der KPD. Protokoll und Materalien. Herausgegeben (Founding Congress of the KPD. Minutes and Documents), Hermann Weber. Eugen Levine was executed a few months later as a leader of the Bavarian Council Republic. Frölich, a prominent representative of the Bremen Left, was later to write a famous biography of Rosa Luxemburg. Protokoll und Materalien, pp 196-199. Although he soon was to reject completely any class party as bourgeois, and to develop a rather individual vision of the development of class consciousness, Otto Rühle was to remain true to Marxism and the cause of the working class. At the congress, he was already a partisan of the "Einheitsorganisationen" (political-economic groups), which in his opinion should replace both the party and the trade unions. In the debate on the "economic struggles" Luxemburg replies to this point of view, saying that the alternative to the trade unions is the workers' councils and mass organs, not the Einheitsorganisationen. According to Clara Zektin, Jogiches, in reaction to the discussions, wanted to end the congress in failure i.e. postpone the foundation of the party. Ibid p206. According to the minutes, this suggestion was greeting with shouts of: "Quite right!" Fortunately, Fränkel's motion was voted down. Ibid p209. For the same reason Gelwitzki, the previous day, said it had been "shameful" even to have discussed this question. And when Fritz Heckert, who did not have the same revolutionary reputation as Luxemburg or Liebknecht, tried to defend the position of the central committee on participation in the elections, he was interrupted by a shout from Jakob: "here speaks the spirit of Noske" p117). Noske, the Social Democratic minister of the interior of the bourgeois government of the hour, went down in history as the "bloodhound of the counter-revolution". "The congress demonstrated sharply the youth and inexperience of the party. The link to the masses was extremely weak. The congress adopted an ironic attitude towards the left Independents. I did not have the feeling of already having a party in front of me." Ibid p47. See the arguments of Marx and Engels within the Communist League after the defeat of the 1848-49 revolution. A large part of this excluded majority went on to found the KAPD. Suddenly, there were two communist parties in Germany, a truly tragic division of revolutionary forces! Max Hoelz, sympathiser of the KPD and the KAPD, whose armed supporters were active in central Germany at the beginning of the 1920s. Walter Fähnders, Martin Rector: Linksradikalismus und Literatur, Untersuchungen zur Geschichte der sozialistischen Literatur in der Weimarer Republik (Left Radicalism and Literature, Studies of the History of Socialist Literature in the Weimar Republic). P. 262. Adam Scharrer, a leading figure of the KAPD, continued to defend the need for a revolutionary class party until the crushing of the Left Communist organisations in 1933. The first appearance of a radical socialist youth movement was in Belgium in the 1860s, when young militants agitated (with some success) the soldiers in the barracks to prevent their use against striking workers. See Scharrer's novel Vaterlandslose Gesellen (which translates roughly as "unpatriotic rabble"), written in 1929, as well as the biography and commentary of the "Arbeitskollektiv proletarisch-revolutionärer Romane" republished by Oberbaumverlag Berlin. One of the most important witnesses of this chapter of history is Willi Münzenberg, for instance his book Die Dritte Front ("The Third Front"): "Reminiscences from 15 years in the proletarian youth movement" first published 1930. The acknowledged leader of pre-war socialist youth was in Germany Karl Liebknecht, in Italy Amadeo Bordiga. The example of the maturation of socialist youth in Switzerland under the influence of regular discussions with the Bolsheviks during the war shows what was possible under more favourable circumstances. "With great psychological ability, Lenin drew the young people towards him, went to their discussion evenings, praising and criticising always in a spirit of empathy. Ferdy Böhny later recalled: ‘The way he discussed with us resembled the Socratic dialogue'". (Babette Gross: Willi Münzenberg, Eine politische Biografie p93).